Mañana was established from humble beginnings. With 7 chalets and a small restaurant. Due to the laid back and relaxed atmosphere that we have to offer we found it hard to turn away people due to lack of accommodation. 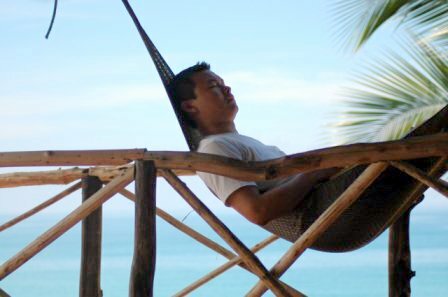 Many of our guests simply did not want to leave and even offered to sleep on hammocks and on the beach. This encouraged us to expand another 8 chalets, ad ding a bigger restaurant and a bar. But never giving up our philosophy of keeping everything simple and harmonized with our environment.. We have no TV, no air conditioning and most importantly no cellular phone reception. We have no concept of time or day. All we want is our guests to enjoy the sun, sea and get away from stresses of daily life. So visit us at Mañana, and be assured of the most restful and stress free experience of your life. Basically nothing.....if all you want to do is sit on the beach and read a book. 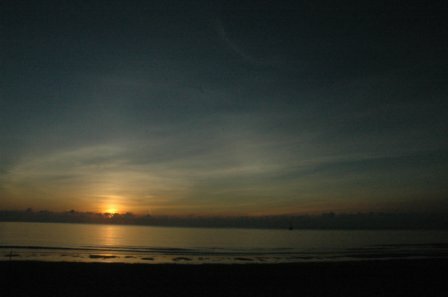 We however do offer the most beautiful sun rise on the island. A 40-50min hike to a pristine waterfall, scuba diving, snorkeling and fishing trips. 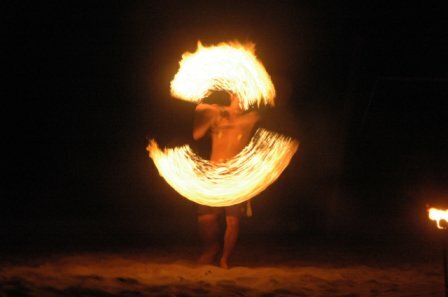 At nite,the bar is open (well technically it is open all day) but it is during this time that we usually have all our guests together where they can have a few beers or spirit available at that time and enjoy the show put on by our resident fire throwers. It is a sight to be seen. And if those of you interested in learning our boys are ever ready to teach the eager. Send mail to the ssaigal@gmail.com with questions or comments about this web site.